You might not be aware, but MY DAD is awesome. In addition to being hilarious (but please don’t encourage him), creative, smart, kind, and sensitive, he is also a professional volunteer. Since his retirement, he elected to spend his time volunteering for several Minnesota organizations. He tutors new immigrants in English and prepares people for to take their GED. He also works as a mentor at the Youth Center of Neighborhood House, an amazing organization in downtown St. Paul, MN. (Clearly you should make a charitable donation there in honor of MY DAD). 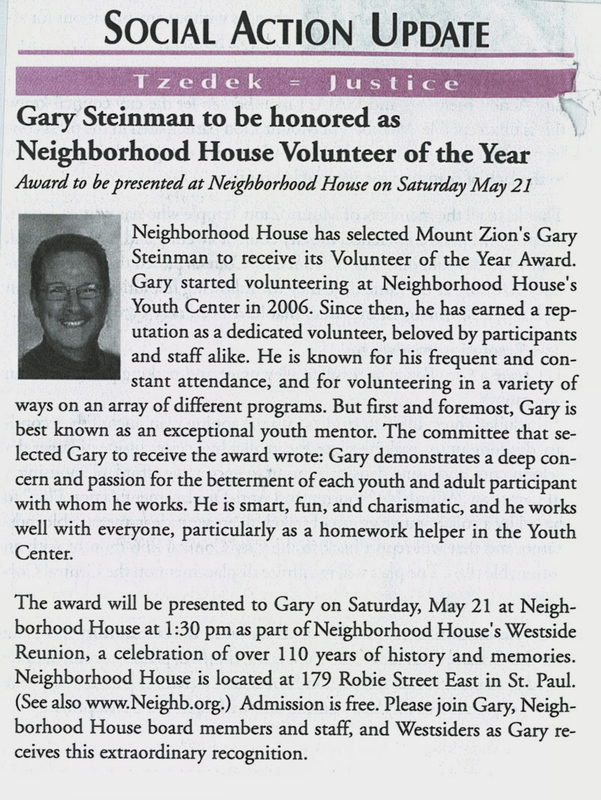 This year, Neighborhood House selected him as their Volunteer of the Year. When they called him to let him know it brought tears to his eyes. When he told me, it brought tears to my eyes, too. The Neighborhood House community is a second family for MY DAD. The outpouring of love and support that THE DIVA and I saw from them after MY MOM’s death showed us that he is just as important to them as they are to him. THE DIVA, MY DAD, and I know MY MOM is smiling about all of this. You know that I am passionate about social justice issues, as you can see, I come by it honestly. MY DAD is making a difference every single day. And if you ask him, I am confident he would tell you that he gets more out of it then the people that he tutors. THE DIVA and I are so proud of him. This entry was posted in family, tzedakah, tzedek. Bookmark the permalink.